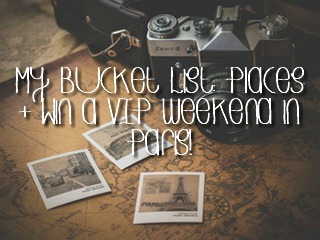 My Bucket List: Places + Win a VIP weekend in Paris!!! I’ve had an idea. I don’t have a bucket list but I hear people talking about theirs all the time. So… I thought I’d start a bucket list of my own, and share it with you! I’m starting with places. These are cities, towns, states etc that I would love to visit – including whether I have already ticked them off or not! Edinburgh. Let’s start close to home with the Capitol of Scotland. I’ve never been but have been told it’s absolutely beautiful and that everyone is super friendly. Definitely one of the top entries on my list. London. Again staying close to home, this time the Capitol of England. This is one I can check off my list. I’ve been quite a few times for various reasons. The most memorable for me being for the Queen’s Diamond Jubilee in 2012 and then again later that year for the Olympics. Paris. A bit cliché? I agree. But I’ve never been and I think it’s definitely something everyone should have on their list and be able to check off. Maybe one day I’ll take my son and we’ll see the Louvre and the Eiffel Tower. Reykjavik. Iceland’s Capitol. Although it’s really cold, there is one HUGE reason I want to go to Iceland – the Aurora Borealis. I’ve not been but I really hope one day I can check this off my list. Melbourne. We’re going a bit further afield for this one. And yes, I have been. I was very lucky to be given an opportunity to go when I had been with my partner for just one year. He has family out there and I was invited to go and stay with them for 3 weeks. It’s a beautiful city and I can not wait to go back with our son. Florida. Firstly, yes I have been. Secondly, the reason? It’s simple really. Disney World. ‘Nuff said. Hawaii. One of the place I not only want to visit (I haven’t as yet) but would love to move to. Everything I’ve seen about Hawaii looks simply stunning and I would hop on a plane tomorrow if the opportunity arose. Italy. I haven’t been to Italy so can’t check this one off. There are several places in Italy I’d love to go to, all very popular touristy places – Rome, Naples, San Marino, Florence, Milan, Venice… You get the idea. Vatican City. I was going to include this under Italy but as it’s classed as it’s own country I have given it it’s own entry. And there you have it. The places I want to visit, and some that I have already been lucky enough to. Previous Post Five Favourite Friday….On Saturday!